At the end of the Divine Liturgy, after the ambo prayer, the dismissal is omitted; the clergy and servers go down to the place in the nave where the water has been prepared for the blessing, while the choir sings the following chants. 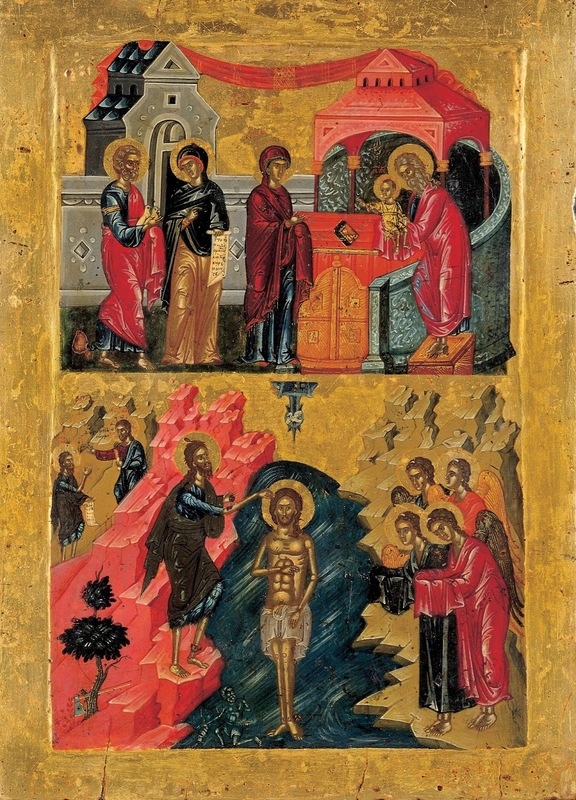 Today the nature of the waters is sanctified, and the Jordan is divided, and holdeth back the flow of its waters, seeing the Lord being baptized. As a man didst Thou come to the river, Christ our King, and dost hasten, o good one, to receive the baptism of a servant at the hands of the Forerunner, because of our sins, o lover of mankind. Glory be. Now and forever. 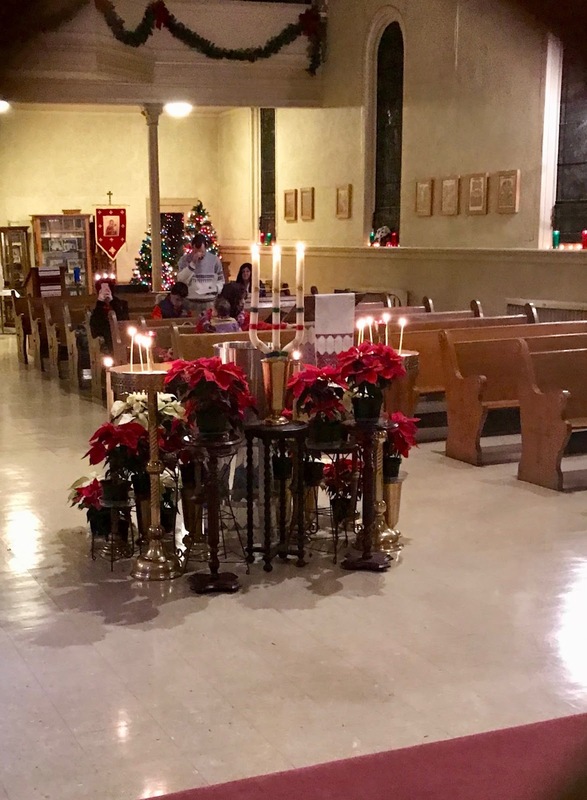 The vessels of water set up for the blessing at St John the Baptist Byzantine Catholic Church in Minneapolis, from our most recent Epiphany photopost. These chants are followed immediately by a synaxis of readings, following the usual format of the Byzantine Rite for such occasions: three prophecies, an epistle and a gospel. The prophecies are all taken from Isaiah: 35, 1-10; 55, 1-13, and 12, 3-6. The Epistle, 1 Corinthians 10, 1-4 is preceded by a responsorial chant called a Prokimen, taken from Psalm 26, “The Lord is my light and my Savior; the Lord is the defender of my life.” The Gospel, Mark 1, 9-11, is preceded as always by an Alleluia, with verses from Psalm 28, “The voice of the Lord is upon the waters: the God of glory has thundered upon the waters.” The ordinary ceremonies (incensing during the Epistle, lights at the Gospel) are done as always. 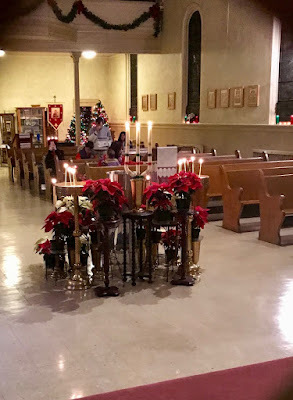 Immediately after the Gospel, the Litany of Peace which opens every major service in the Byzantine Rite is sung, with a number of special invocations added to it which are specific to this occasion. The first of these reads “that this water may be sanctified by the descent and power and energy of the Holy Spirit”, the second, “that the purifying energy of the supra-essential Trinity may descend upon these waters,” etc. While these are sung by the deacon, the priest silent reads a prayer, broadly analogous to the Preface of the Eucharistic liturgy; the conclusion, however, is a typical doxological formula, rather than the mention of the angelic hierarchies that normally leads into the Sanctus. At the following words, which are repeated three times, the priest makes the sign of the Cross over the waters with his hand. Like the Roman Exsultet, the prayer concludes with a prayer for the emperor, the government, the ecclesiastical hierarchy, and the people. Following the standard order of the Divine Liturgy and the major Hours of the Office, the priest then says “Peace to all”, which is answered, “And with thy spirit”, then “Let us bow our heads to the Lord”, to which all answer, “To Thee, o Lord.” A prayer is said by the priest in silence, which here has a special form for the occasion. “Incline, o Lord, Thy ear and graciously hear us, who accepted baptism in the Jordan, and sanctified the waters. Bless us all, who by the bending of our necks, signify the character of servitude, and make us worthy to fulfill Thy sanctification, through the partaking of and cleansing with this water, and be it unto us, o Lord, the cleansing of souls and body.” The conclusion, as usual, is said aloud. The faithful then come to kiss the Cross, as they normally do at the conclusion of the Divine Liturgy; as they do, the priest also sprinkles water on the head of each person individually. It is also customary for the faithful to drink some of the blessed water as well.